How One Campaign Can Generate You £48,000 in Value. I just wrapped up a 1-year Content Marketing campaign for my client, lovereading.co.uk. The campaign had an incredibly low cost, but generated about £40,000 in the value of placements – not to mention over 600,000 visitors to the site. I’ll dig into the main facts and figures of the campaign first, but I’ll also identify some key actionable ideas which worked well. I’ll save them for the end. Lovereading.co.uk wanted to improve their visibilty online, using content, so they engaged my services. To gain placements and mentions in high-authority, well-trafficked publications. To improve their search engine rankings. To increase traffic to the Lovereading site. To position Lovereading as an expert-resource for book lovers around the world. I work almost exclusively with SMEs, so naturally I like to do everything on a conservative budget. This means as well as delivering on all of the above, the campaign had to be financially viable for both the client and for me. We finally settled on four ideas to be released across the year. The latest series of Game of Thrones (Season 4) had just ended on HBO, and the internet was buzzing about the series. We decided it would be appropriate to bring everyone’s attention back to the original A Song of Ice and Fire books, which the series is based upon. As such, I created an interactive page which listed the fate of every character, spoiling it for the show watchers. The research was pretty easy, as the entire content team are ‘A Song of Ice and Fire’ experts. We hired a Game of Thrones forum member as a fact-checker. The design was the most fun part. We made it as testing as possible for users, asking them repeatedly if they were sure they wanted to spoil it. It was a really interesting way to present the information. When it comes to promotion of content online, it always pays to tap into existing communities. ‘Fans of the Game of Thrones TV Show’, and ‘Fans of the Song of Ice and Fire books’. 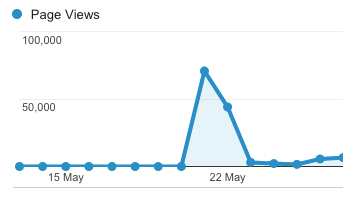 The Game of Thrones Spoiler Machine received an astonishing amount of traffic during its first few days. This is due to the strategic locations in which the content was seeded. At one point, the lovereading.co.uk site had 2,000 concurrent users. 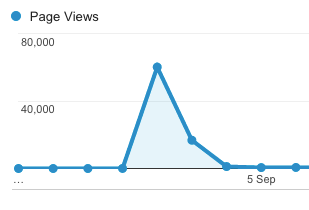 An excellent boost of traffic from a resource which still continues to gain page views. It should be no surprise to any Content Marketer that infographics can be an excellent way to gain exposure for a brand online. If you’re not sure why, check out this post from Moz. Having had some very solid success with infographic promotion the year prior to this campaign, (including a feature on Page 3 of the print version of The Times! ), it seemed like a no-brainer to keep up the good work in gaining high authority placements. This is an oft-blogged about idea, so it was more a matter of narrowing down the information to the best ones. The design process for this piece was pretty complicated. We work in close partnership with a number of freelance designers (in order to scale our work and keep costs down). The illustration is obviously the major draw of the graphic, but the layout and type is just as important, so we needed specialists from each field. 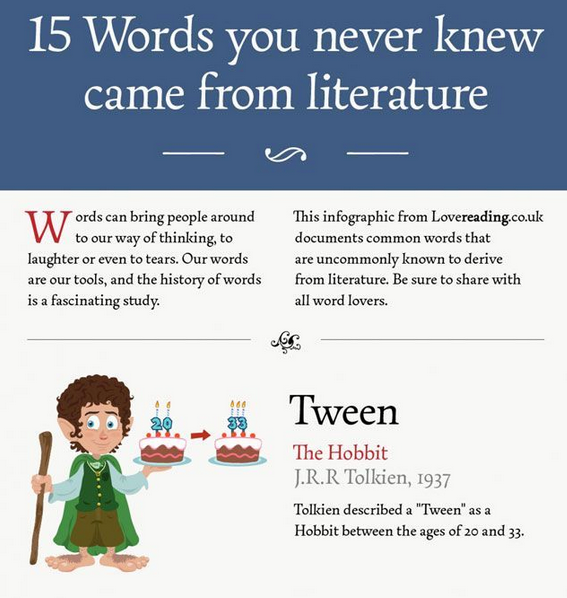 The infographic was featured pretty widely in literature blogs. Overall (aside from social shares) it received around 39 placements from websites with a very solid authority. As infographic marketing specialists, and general web geeks, it seemed like a natural conclusion to take advantage of the customisability of Google’s Maps Engine, allowing users an insight into the settings of the most popular English language books in history. It only took a researcher a couple of hours to identify the setting of the most popular English language books. The design was fairly straightforward. The books needed to be placed into a Google map, and a header banner and sharing buttons added. This was all relatively inexpensive. The Google Maps Mash-Up surpassed both the client’s expectations and our own expectations too. We knew it was a great piece of content, but the level of coverage it has received in its first few months make for an excellent case study. In total: 741 Backlinks were received from 118 Domains! In terms of traffic, the resource also performed outstandingly, attracting some 75,000 visitors on its first day (due to careful seeding), but now due to the spread of its promotion, it continues to bring in dozens of visitors per day. We’d had our fun all those months before by spoiling the series for TV watchers, so it seemed fair to give them something useful, and capitalise on the deafening buzz around Season 5 of Game of Thrones which was fast approaching. This was a masterclass in repurposing content. We used the framework we already had for the above resource, adding new info and promoting it widely, and the results were fantastic. This was a really simple one – we just had to find a writer who was well-versed with the show and pay them for a couple of hours work in updating our character list. There was no real design cost as this was a pretty straightforward case of updating the existing html. The promotional activity for this followed a practically identical process to the Spoiler machine (above). 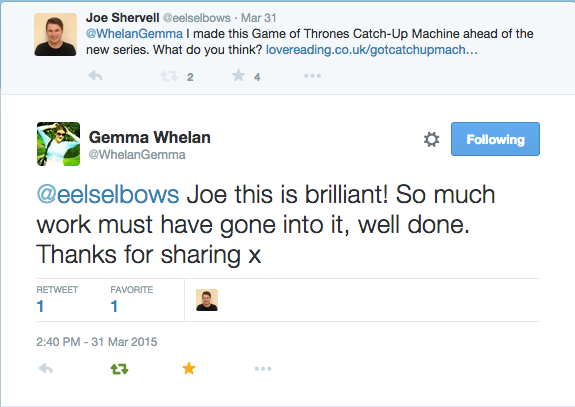 The Game of Thrones Catch Up Machine proved incredibly useful and incredibly popular. It was widely mentioned by high-authority sources and Game of Thrones blogs – securing many solid placements on well-trafficked sites, and certainly helping to cement Lovereading’s position as Game of Thrones experts. In total: 26 mentions (with links) of Lovereading.co.uk came from 15 domains . The traffic to the resource was also of a standard which we had come to expect from previous resources. Over 200,000 visitors visited the site on its first day, with close to 300,000 page views for the whole lifetime of the piece. In terms of measurable impact, this graph shows the effect on the online visibility of Lovereading. The graph is based on the past year. The site now ranks for major high traffic keywords relevant to Game of Thrones, such as ‘Game of Thrones Spoilers’ and ‘Game of Thrones Catch-Up’ (both in the top 5 results). Interestingly, the site also now ranks around position 9 for ‘Google Maps’. So how about Return on Investment? It’s always hard to give a return on investment for ‘links’ and ‘placements’, but as a crude but fair measure, most high-authority, well-established blogs would charge a minimum of £1,500 for an advertising spot. Smaller blogs might charge around £100, but ultimately nobody will promote your business online for much less than that. Based on the 20 major placements, and the 181 other placements, paying for advertising in all of these places would have cost around £48,100. The traffic to the site is hard to price, but it seems fair to say that any sane business owner would consider 600,000+ relevant visitors to their site to be invaluable. The rankings we have established will help to bolster lovereading.co.uk’s visibility into the future, making them able to compete with their competitors with much higher budgets and infrastructure. Again, this is invaluable. When I create content, I follow a few very simple rules. These are rules reached after years of trial and error. (Rules we’re so confident in that I teach them in Masterclasses to business owners and marketing managers). Alongside STEPPS the content should be as easy to share as possible (sharing buttons, calls to action). This is the kind of content that inspires bloggers and journalists to write about it. The content needs to be well-designed. In fact so well-designed that it could stand on its own as an example of good design, regardless of the information contained within it. The content needs to be so well-researched that it leaves no question that you are an expert in your industry. There needs to be a strategy in place before the content is even finished to ensure as many relevant people see the content as possible. What doesn’t get seen doesn’t get shared, and as such we need to make sure bloggers, journalists and social media influencers see the content and share it. This means we need to ensure the content gets massive exposure on places where these influencers look for content – places like Reddit, StumbleUpon, Facebook, Twitter and their own e-mail inboxes. Firstly, I want you to know that gaining this level of coverage is achievable, both in terms of skill and cost. Secondly. You may be interested in learning more. I host a Masterclass called ‘How to Make Awesome Content and How to Make it Go ‘Viral’, and I’d love to have you along.